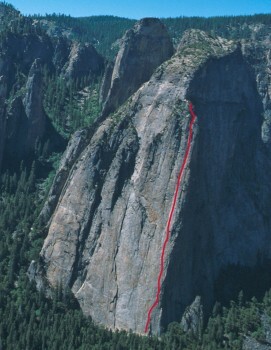 The Direct North Buttress of Middle Cathedral was one of the most difficult climbs in the world when it was freed in 1965, and it remains a burly testpiece. Steep chimneys that are very long, continuously difficult and poorly protected make the DNB a major undertaking. The DNB deserves its Grade V rating, and many parties are forced to bivy on the route or at the top prior to the extremely exposed Kat Walk descent. Which SuperTopo guidebooks include a topo for Direct North Buttress? One lazy Camp 4 afternoon in September 1961, Yvon Chouinard forced me into his car and drove down to El Cap Meadow without telling me what was up. This sort of thing had happened before, so I steeled myself for another rave. After we parked I was relieved when he looked south toward the Cathedral Rocks rather than north to El Cap, because I was terrified of the latter and only mildly scared of the more benevolent Cathedrals. “Look!” Chouinard exclaimed, pointing to the far right side of the wide northeast face of Middle. I wasn’t too good at picking out new lines, but I pretended to agree before confessing that I certainly couldn’t see what the hell he was talking about. “No route there, man,” I said (this being before the days of “no route there, dude.”). Of course a few days later we were up there, wandering between thin flakes and nubbly footholds, half the time unsure of where to go next. “No route here, man,” I often proclaimed, hoping Chouinard would believe me and we could retreat with honor. Actually, I was enjoying myself quite a lot, pounding pitons behind door-sized flakes, ignoring the monotone sound as the iron hilted way too easily (the classic sound of a well-driven piton, for those who have never driven one, is a rising pitch with each blow, almost orgiastic in tone). At one dicey spot in the early afternoon I popped an aid pin and a few below and tumbled 35 feet, my record at the time. We used lots of aid, too smart and too scared to head upward on possible 5.9 above poor placements. Yet we moved as smartly as coyotes on the hunt, and by dusk we had climbed 900 feet of brand-new terrain, complex and never easy. Relaxing onto big ledges, I unpacked my only bivy gear: a sweater and a down jacket. After a few munchies and philosophical discussions about the newest waitress in the coffee shop, we curled into fetal positions and actually went to sleep. Not for long, though. The rain was totally unexpected, and to our surprise it didn’t let up. Soaked and shivering by morning, we looked up at the prominent crack system above us. Our projected route had become a waterfall. Luckily, we were able to move left on roomy, connected ledges and, after a few easy pitches, reached the Kat Walk, a familiar descent route. Nine months later in June 1962, Chouinard and I were back at our high point by early afternoon, in perfect weather. About 400 feet higher we bivied. Then at midnight, rain struck once again, and we howled at the gods. By dawn this storm had become a mere drizzle, and we decided that up was better than down. The flared cracks that rose above us would have been hard in dry weather, but now they were slippery nightmares. As a master chimney expert, Chouinard led more than his share and did a superb job in the pitter-patter of rain. Much higher, as we passed abeam the previously named Thirsty Spire (what a misnomer now! ), we knew the route was ours and gave it the unimaginative but accurate name: Direct North Buttress. By late afternoon we topped out and staggered back to the valley floor. Stalking the store for groceries, we weighed my down jacket on a scale. Seven and a half pounds! DNB follows a direct and intimidating line up the North Buttress. Central Pillar is considered one of the best climbs on Middle Cathedral.